The Bikini Bootcamp Book Winner is……. Happy Monday all! Today I woke up sleepy but whipping through 38 minutes of circuits, plus Meditation and Yoga I am awake and positive. 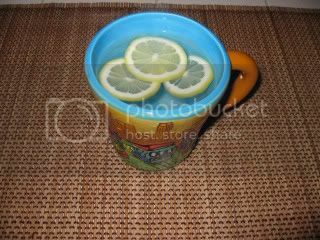 While I got ready, I had a big cup of Morning Burst (lemon slices plus hot water) to detox from my weekend snacks. I am challenging myself for the remaining 7 days to eat only what is on the Bikini BootCamp Progam! It was refreshing and delicious. I LOVED being able to spoon it out of the glass – it made my smoothie seem like more of a meal. I was FREEZING after though so I had to warm up with some nice watered down decaf coffee. I put everyones name on a paper and randomly selected the name from a box. The winner of a free copy of the Bikini Bootcamp Book is C.G. The Foodie!!!! Congrats C.G!!!! I will get the book sent out to you ASAP so you can start the program. No worries for those who didn’t win as you are a winner already just by taking on the Bikini Bootcamp challenge. The entire month of June is designated as Bikini Bootcamp month so sign up today. Those participating will be eligible to win some great rewards as incentives to stick to it! * Can you spot what 100 calories looks like? Click HERE to take the fun quiz! * TWO Giveaways ~ Nalgene Grip n Gulp & Thorlo Experia Milti-Sport socks ~ Click HERE! That smoothie looks delicious! I had a mango today, and it was so yummy. Congrats to C.G! mmmmmm the mango smoothie looks delicious! !Just wanted to let you know that I got the tee and it is cute!! Jenny ~ Thanks I did – I actually had fun, can you believe I am saying that? 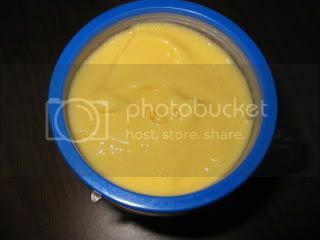 Anne ~ I am surprised how good mango can be – I never used to like it. Priyanka ~ Yeah for getting your Hungry Girl book Tour T-Shirt – Are you going to sport it for us to see on you?! that mango smoothie looks amazing! i had a mango smoothie this weekend, and it was the best thing ever. i used greek yogurt and also half a banana, and you're right, with the greek yogurt it is much more filling. Hooray!!!! I am so excited!!!!! And I am loving up that Mango smoothie! K ~ I was freezing after having my smoothie, but, it was tasty! Step ~ Yum – your weekend smoothie sounds fantastic! C.G ~ Congrats – I can't wait to watch you succeed!